Gorgeous 3 bedroom Oceanfront Getaway Located In Cundys Harbor. This expansive home offers multiple living areas, butlers pantry, a great dock and maticulous grounds. Cozy ranch style home with beautiful water views. Looking for your own private oceanfront getaway? Look no further! Safe Haven is a private oceanfront home located on over 10 acres in Cundy's Harbor. This 3 Bedroom, 2.5 bathroom home is just short of 3,000 square feet with a two car-garage, pebbly beach and dock. Amazing craftsmanship, this home spares no expense with crown-molding, pillars, and beautiful decor throughout. Bring your family to enjoy Maine's coastline and kayak from the dock or shoreline up into protected Quahog Bay. Conveniently located only 8 miles from Brunswick you can enjoy oceanfront living while still being close to grocery stores, shopping and restaurants. As you walk into the house you are greeted with cathedral ceilings, a lovely chandelier and a grand staircase, you surely will feel welcomed! A half bath is located at the entryway for your convenience as well as an office area should work follow you on vacation. There is a comfortable, formal living area with a fireplace, and wall-to-wall windows looking out to the sea. As you make your way further down the hallway the fully equipped kitchen has all you will need to make your favorite seafood dish but also allows an open feel to the dining room and living area so you can enjoy each others company. There is even a large butlers pantry. The cozy informal living area offers cable TV, comfy furniture, a woodstove and French doors leading to the covered porch. The large dining area with its beautiful textured walls, and lots of windows offers ample seating space and a fantastic wet bar. A large laundry room completes the main floor. As you ascend the grand staircase you will find three large bedrooms, two with ocean views. The spacious master bedroom offers a queen bed, walk-in closet and en-suite bathroom assuring you will be living in luxury while staying at this home. The remaining two bedrooms; one with a queen bed and the other with two twins share a full bathroom. 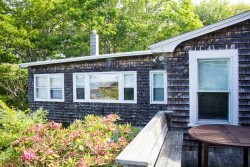 The grounds of this home are a rarity in the Harpswell area. A large level yard is perfect for the kids to play or just to sit and enjoy your favorite drink on a warm summer day. This home also abuts conservation land, and has a wonderful path along the shore and through the woods to a beautiful pond. The dock allows you to bring your boat with you on vacation, as the public boat launch is just 1000 feet down the road. A mooring is also available should you have a larger boat you wish to bring. Don't forget the expansive deck overlooking the bay - enjoy some of the most picturesque sunsets! Don't miss out on this great home - book Safe Haven today! The house is beautiful inside and out. I cannot think of a single thing I would change. Stunning setting and very aesthetically pleasing property on the water!! Hilary was a pleasure to do business with. We made our first contact through airbnb, which brought us to Your Island Connection. Now that we are aware of Your Island Connection, we will go directly to them. I have vacationed in Maine for several decades and have visited many areas from York to Lubec. Harpswell was an area I had not visited. I enjoyed Harpswell immensely and do plan to return. It is an easy location to access and the nearby areas and restaurants are within a short and easy trip. We particularly enjoyed the short hikes throughout the area. We found the architecture and the grounds to be outstanding. I enjoyed the bathtub in the master bath. Every room seemed to have a complement of books ... good books and lovely poetry books. Overall, the house is 'over the top'.